OBDII/EOBDII MEMO SCANNER is a kind of auto device for reading and erasing trouble code in vehicles, sometimes called car reader. Though so small, light and handy, which is dynamic and fashionable in design, competitive in price and easy to use. 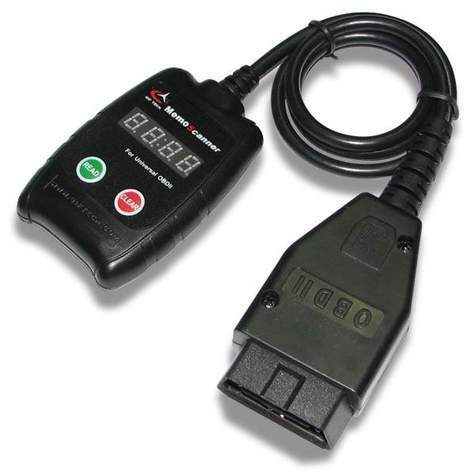 ItÃÂ¢Ã¯Â¿Â½Ã¯Â¿Â½s absolutely the same function as special tool of its kind and applicable to all models since 1996 with a 16-pin diagnostic socket for generic OBDII protocols (SAE j1850 PWM, SAE j1850 VPW, ISO9 141-2). OBDII/EOBDII MEMO SCANNER is specially designed for car owners or DIY. With an MEMO SCANNER, you may quickly find out trouble causes (troubleshooter) of electronically controlled systems on your car, by simply connecting MEMO SCANNER with the diagnostic socket, via reading the trouble code (DTC) shown on MEMO SCANNER, identifying, locating and checking out trouble causes with attached userÃÂ¢Ã¯Â¿Â½Ã¯Â¿Â½s manual. Each trouble code discovered will be displayed on MEMO SCANNER for 3 times, 5 cycles later all the trouble codes will be automatically erased.